Trying to decide between an apartment or home for rent in Morrisville, PA? Discover the benefits of apartment living. First, you'll save money on a mortgage. As if that weren't enough, repairs aren't your responsibility. Just pay the rent and enjoy life. 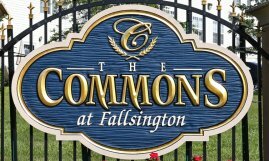 An apartment or townhome at The Commons at Fallsington is a great base from which to enjoy Bucks County and Central Jersey. You're minutes from attractions like the NJ State Museum, the Old Barracks Museum, the Trenton Thunder, and the Bucks County Playhouse. We bring you terrific amenities like a swimming pool, clubhouse, fitness center, controlled access, and 24-hour emergency maintenance. Pets are welcome, and we're located in the award-winning Pennsbury School District. Ask us for more information on the Commons at Fallsington. Looking for Apartments for Rent in Bucks County, PA?